When I first saw the trailer for Generation Zero I was immediately intrigued. Being a fan of all things sci-fi the theme of having to fight against rogue robots made for a good setting for a video game. Then add in the fact that the game added in survival mechanics, co-op mechanics and the ability to selectively destroy parts of a robot in combat; and the gameplay looked really interesting. All this was combined with a 1980s theme. I was really excited to try Generation Zero. 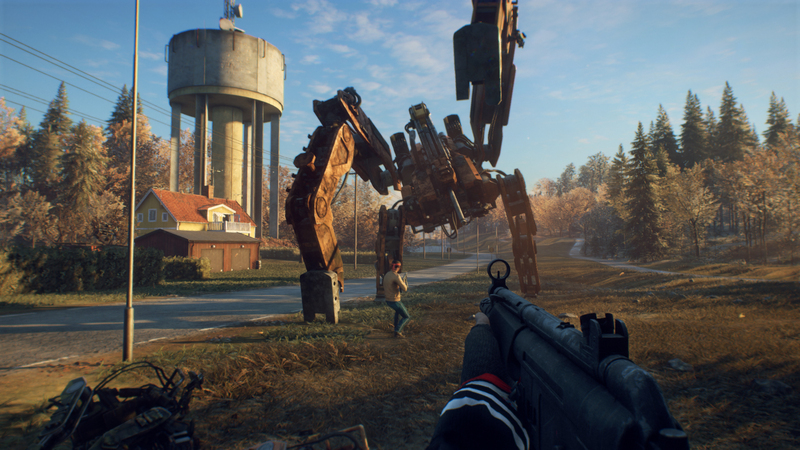 Generation Zero has all of the makings of a great game that unfortunately gets bogged down by a lot of bugs and some curious gameplay decisions. We at Geeky Hobbies would like to thank Avalanche Publishing and Avalanche Studios for the review copy of Generation Zero used for this review. Other than receiving a free copy of the game to review, we at Geeky Hobbies received no other compensation for this review. Receiving the review copy for free had no impact on the content of this review or the final score. Generation Zero takes place in 1980’s Sweden. You and a group of your friends return home from a vacation when your boat crashes ashore. As you explore your home and neighboring area you notice something is amiss as everyone is missing. It turns out that after World War 2 Sweden decided that it needed to increase its national security which lead to the creation of military robots. For some unknown reason these robots have turned on humans and fire on any human they see. You and a group of up to three other players must work together to survive in this dangerous new world as you try to figure out what happened. One of the reasons that I was most interested in Generation Zero is that the gameplay looked really intriguing. First-person shooters are not my favorite genre but I don’t mind them either. What intrigued me about Generation Zero though is that it seemed to combine a bunch of interesting mechanics. The main mechanic in the game is the first-person shooter mechanics. Generation Zero doesn’t revolutionize the genre as these mechanics are similar to what you would expect from any other game in the genre. They were surprisingly satisfying though which is not all that surprising as one of the things Avalanche Studios is most known for is theHunter series which is a series where you hunt wild animals. Generation Zero does a good job utilizing this experience as the shooting feels realistic and satisfying. I think the coolest thing about the combat is that it matters where you shoot a robot. Each robot is comprised of different parts and it actually matters where you target them. The location you target matters for a couple reasons. First some parts of the robot are more heavily armored. Obviously you want to avoid these areas of the robot as you will have to waste more bullets destroying the armor. The more interesting part is that you can disable parts of a robot by destroying some of the components. Destroy the robot’s guns and it can no longer shoot at you. Fire on the robot’s energy core and you could get the whole robot to explode. This adds a tactical element to the game as you choose which parts of the robot to target in combat. In addition to the first-person shooter mechanics, there is also a survival/scavenging mechanic. As you are playing in a post robotic uprising, items are scarce. You can’t just go to a store and buy whatever you would like. This means that you have to scavenge for all of the items you need. Get ready to scavenge every building and car you see. From what I have seen so far, almost every building and car you encounter in the world can be explored. This is important as you need to keep finding weapons, ammo, and items in order to survive. This scavenging mechanic does a really good job supporting the game’s theme of living after a robot uprising. Speaking of the theme, the visuals and theme in general are fantastic. I ended up playing the game on PS4 and I was genuinely surprised by how good the visuals are. As soon as the game begins you can tell that a lot of work was put into the game’s visuals. From little details that help sell the game’s 1980s setting to just the world itself, it is hard not to be impressed. The quality is most impressive with regards to nature as it feels like you are truly walking through a woods. On top of the visuals the game does a pretty good job creating an interesting mystery as you try to figure out what went wrong leading to the robots turning against humans. While I have only played the game for a few hours (more on this soon), I have to say that I have enjoyed my time with the game. The gameplay is fun and the atmosphere works well for the most part. I was also genuinely surprised by how large the world looks. I have only played through a tiny section of the map but the world looks massive. Apparently it takes around 20-30 hours to beat the main missions. If you want to fully explore the landscape though I think the game could take quite a bit longer. While there is a lot that I liked about Generation Zero, unfortunately the game fails to live up to its potential as it has quite a few issues. Anyone that has looked into the game has probably read that the game has a lot of bugs. This is somewhat overblown, but the underlying fact is absolutely true. There are a lot of bugs in Generation Zero and they do impact the gameplay. A lot of the bugs I encountered were graphical where textures would pop in and out. These bugs were annoying and occasionally took me out of the experience. They were not game-breaking though. Unfortunately this is just the beginning of the bugs. The robot’s AI also seems to have issues. The first robots you encounter in the game might appear intimidating at first but once you get used to the game they can be quite stupid. There are times where they should be able to see you and they don’t. Other times they see you when they shouldn’t. For example they seem to be quite adept at seeing and shooting at you through walls. While these bugs occasionally work against you, you can usually take advantage of them to easily dispatch enemies. By far the biggest bug I encountered in the game though was truly game-breaking. I got a couple missions into the game and had pretty extensively explored the first island. It then came time to move onto the second island. I reached the bridge that connected the islands and started walking across it. I then suddenly hit an invisible wall and couldn’t progress. I tried crossing the river on foot but the game doesn’t let you enter the water so I was immediately teleported back to land. I then searched around the area to see if there was something that I was missing but I couldn’t find anything. I even turned off the game and reset back to a previous checkpoint and it still didn’t help. There was literally no way that I could progress in the game without starting over from the beginning. As I didn’t know if the bug would occur again, I didn’t think it paid to begin again from the start. Therefore I am currently stuck at this point in the game. The bugs are by far the biggest problem with Generation Zero but they are not the only issues I had with the game. I would say the biggest problem with the gameplay is that it doesn’t give you a lot of direction. Most of the missions (at least to the point where I was blocked) tell you where you need to go next along with a vague direction. For example a mission will tell you the next location is to the west of your current location. You are not given a specific location though as it doesn’t even pop up on the map until you get near it. Other times the missions don’t even give you a direction. One early mission has you looking for a hunting cabin that the mission says is nearby. I looked around the area where you get the mission for a long time and couldn’t find anything. I eventually found the hunting cabin but it was nowhere near the location where you pick up the mission. I am guessing the designers chose to handle missions in this way in order to encourage players to explore. In theory this wouldn’t be a problem except that the game takes it way too far. I didn’t expect the game to just show me the exact location on the map but it should have given you a little more direction. To not wander aimlessly around the map you basically have to follow a process. First read the general clues given in the mission and then look for gray buildings on the map that somewhat fit the clues that the mission gave. You then need to go building to building until you find the one that the mission is referring to. This next complaint comes with the caveat that I haven’t played a lot of the game due to the bugs so it might be fixed later in the game. At first the game appears quite tense. All you are given at the beginning of the game is a simple handgun. When you encounter your first robots it is pretty hard to take them down as they significantly outgun you. At this point I thought the game was going to be a game of survival as you have access to few weapons and bullets and you need to conserve both. You would have to pick and choose which enemies you choose to engage. As I began exploring the game more though, I found out that the game is not as difficult as you would expect. There are limited bullets in the game but if you are willing to scavenge you can usually find enough that you don’t have to ever worry about running out of bullets. As I approached the area where I would eventually be blocked by the invisible wall, I had plenty of bullets where I could attack any enemy I encountered. The bigger issue though is once you find guns other than your simple handgun. Once you get your first shotgun and rifle the game becomes quite a bit easier. If you add a scope to your rifle you can see quite a bit away. Therefore you can sneak up on robots, aim for their power packs, and blow them up before they even notice you. When you add in the enemy AI being kind of stupid at times, it is pretty easy to just hide in a house and snipe all of the robots in your general area. I am guessing this is going to improve once you start fighting more powerful robots but it is an issue you encounter in the early game. Another gameplay decision I found to be a little strange was the idea that you can immediately respawn yourself whenever you die. There is an item in the game that you can use instead of returning to your last safe house. Once you use the item you just pop up where you were killed. This usually means that you will come back right in the middle of the fight that just killed you. On the positive side it saves you time as you don’t have to run all of the way from your last safe house to where you were killed. This can become a huge benefit as the distance between some safe houses can be quite far. It kills your element of surprise though as you need to be ready to shoot as soon as you respawn. Logistically it would make no sense but I wish you could respawn away from the fight so you would have a chance to change how you wanted to approach the fight. Spawning right in the middle of a fight means you can be killed again really quickly. The good news is that you can find the item that respawns you all over the world so you don’t have to worry about running out of it. The final problem that I had with Generation Zero is that while I really like the theme, there are a few issues with it. First of all there are a lot of remote areas in the game. There are many instances in the game where you will just be running through the woods from location to location. From a theme perspective this might make sense, but it gets dull after a while running long distances through the woods or on a country road. I applaud the game for the number of houses and other structures that you can explore in the game. Unfortunately after a while they all look basically the same. This doesn’t ruin the experience but it takes you out of it from time to time. I found it really hard to write this review for Generation Zero. I generally don’t like writing reviews after playing only a portion of the game. I ended up writing the review though because I wanted to keep it timely. I wanted to let people know about the bugs that the game has while still pointing out that the game has a lot of potential. I had fun with Generation Zero. The gameplay is satisfying (when the robots’ AI is working properly) and the game’s visuals and theme are stunning. There are a few questionable decisions regarding the gameplay, but I think the game is still pretty fun. This is why the bugs are so disappointing since I think Generation Zero could have been a good/great game if it weren’t for the bugs. The bugs don’t totally ruin the game but they do impact it enough where it is hard not to notice them. Hopefully these bugs can be fixed soon. If these bugs are fixed I might update this review and take another look at the game. As far as the final rating I am going to hedge the final rating some due to the bugs. In its current buggy state the game probably only deserves around a two and a half as the bugs do adversely impact the game. If the bugs are fixed though I think the game could be quite good and might deserve around four stars. Therefore I decided to meet in the middle at three and a half stars as I expect that the bugs will eventually be fixed. It is hard to make a recommendation for Generation Zero at this stage. If the concept doesn’t really interest you, with all of its current problems I wouldn’t recommend Generation Zero. If the concept interests you though, the decision becomes quite a bit more interesting. I think you will enjoy the game but there are a lot of issues with the game right now. I would maybe wait until some of the bugs get fixed before purchasing the game. If all of the bugs can be fixed though, I would recommend picking up Generation Zero. Has amazing visuals and a fantastic theme. The gameplay is fun when it works. The game is filled with game-breaking bugs. Elements of the gameplay don't work as well as you would like.